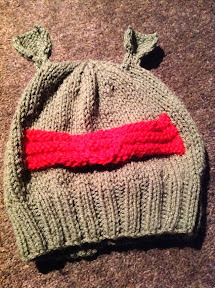 A while ago someone asked me for a K9 Beanie…. And it’s fair to say that I had no clue how to do this. But, I’ve given it a shot. It has turned out pretty well in the end. The size is for a teen. K2, p2 rib over the next 12 rows. Stitch up the back of the hat. Attach ears to the top of the hat, rolling the ear stem bit into a tube before attaching. Stitch on a red circle on top of the red striped area.